In 1644 AD, the Jurchen or Manchu people of Central Asia invaded China and got rid of the Ming Dynasty. The Manchu leaders took over ruling China. They called themselves the Qing Dynasty. The first ruler of the Qing Dynasty was just like the last Ming emperors, a child called Fulin who did not hold any real power. His uncle Dorgon and his mother, the Empress Xiaozhuang, ruled for him, like the Ottoman empresses and Anne of Austria in France at the same time. 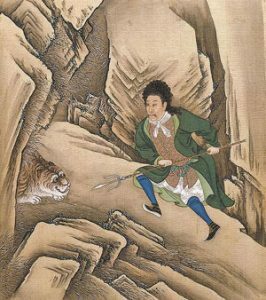 Xiaozhuang was a descendant of Genghis Khan‘s younger brother. When Fulin died of smallpox in 1662 AD, he was still only 23 years old. 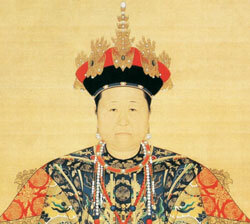 The Empress Xiaozhuang continued to rule through Fulin’s son, her grandson the Kangxi Emperor, who was only 7 years old. She spent most of her energy conquering southern China, so that the Manchus ruled all of China by 1681, and even told people what to do even further south in Vietnam. She also fought off the Russian Empress Sophia’s efforts to conquer Manchuria in 1685. Xiaozhuang lived to be 75 years old, and died in 1688. By this time, Kangxi was 33 years old. Kangxi ruled for another 34 years, living to be 68 years old. He made China much richer and more powerful than it had been before. Kangxi especially worked to fix up China’s rivers and canals. He controlled floods on the Yellow River and repaired the Grand Canal. Kangxi also invaded Tibet in 1717. He died in 1722. Kangxi’s son the Yongzheng Emperor followed him. Yongzheng, like his father, kept power in his own hands. Indeed, like Louis XIV of France and Peter the Great of Russia just before him, Yongzheng tried to get more and more power away from the other rich people of China. 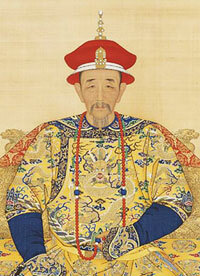 Yongzheng died in 1735 when he was 56 years old, and his son became the Qianlong emperor. Cite this page: Carr, K.E. Qing Dynasty China – History of China – 1600s-1700s. Quatr.us Study Guides, June 4, 2017. Web. April 20, 2019.